As Israel lobbies the US to recognize its sovereignty over the Golan Heights, Jordan’s foreign minister on Tuesday presented his visiting American counterpart with an opposing view of the matter. 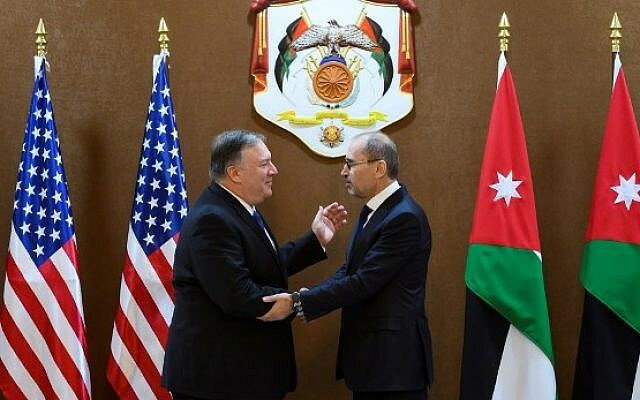 “International law regarding the Golan Heights is clear,” Ayman Safadi told US Secretary of State Mike Pompeo in Amman. “Israel must withdraw from the region as part of a deal that will allow the rights of all sides to be maintained,” he said. On Sunday, Prime Minister Benjamin Netanyahu urged visiting US National Security Adviser John Bolton to recognize Israel’s claim to the Golan.